System One is searching for dependable Cardboard Balers for a weekend shift. This is a long term assignment and would work great for someone looking to supplement their income! The job site is located in North Memphis within a manufacturing facility. 1) Tends automatic machine that bales cardboard boxes: Observes machine compressing, wrapping, and sealing cardboard boxes. 2) May tend automatic machine that stacks bales on pallets for storage or shipment. 3) Removes bales from machines. 4) Turns valves and presses button that resets baling operations when automatic controls malfunction. 3)Operates floor sweeper to clean warehouse floor. Salary: The starting pay is $8.25/hr with an increase in pay after 90 day probation. 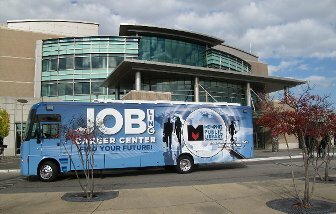 The MATA career fairs will be held Tuesday, May 23 and Wednesday, May 24 at the corner of Levee Road and Watkins Street between 11am to 1pm and 4pm to 6pm. Both events will be on a MATA bus parked at that corner.